In its simplest form, the SALUS Smart Home system cleverly allows you to control and manage your heating from anywhere using an app from your Smartphone, Tablet or PC. Starting with heating controls as a base, it is easy to unlock the true power of the SALUS Smart Home system just by adding a few very simple and easy to install devices. Linked wirelessly to the SALUS Universal Connection Gateway and controlled remotely from the clear intuitive SALUS Smart Home app, the system operation can then be tailored precisely to your needs. The clear but powerful software then allows you to create the exact functions you want to add comfort, safety, security and convenience to your home. 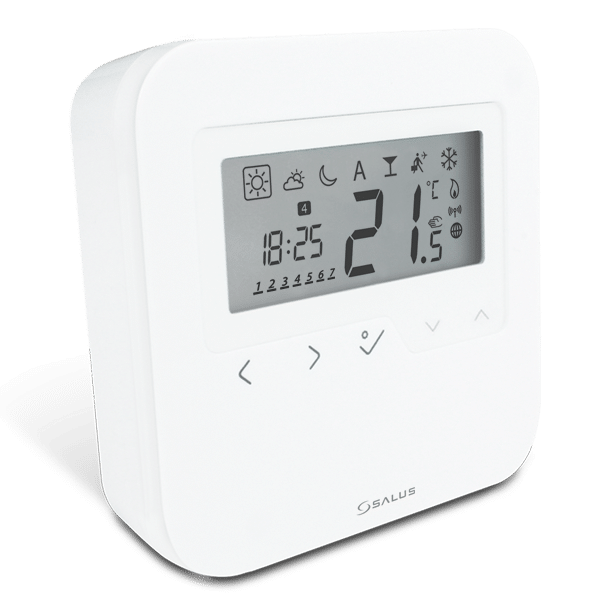 Whether you are wanting an Electric, Hydronic or Underfloor heating solution, you will need the SALUS Smart Home Connection Gateway. 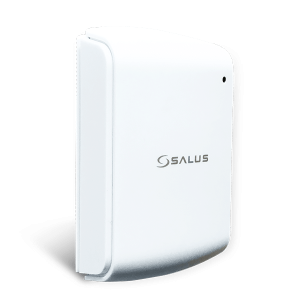 The Connection Gateway is at the heart of a SALUS Smart Home system and allows the user to connect devices so that they link up and interact with one another. The Connection Gateway connects to the internet via standard WiFi or an Ethernet cable. 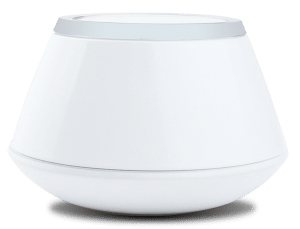 Other Smart Home devices then in turn connect to the Connection Gateway via Zigbee wirelessly. Using a Smartphone, Tablet or PC with a simple app, the user can then link to the Connection Gateway via the internet and control Smart Home devices direct from the home or indeed anywhere in the world. Simple to use and with a clear easy to read LCD display, the HTRS-RF(30) is perfect for users who want to precisely control individual room temperature. With silent switching and TPI (Time Proportional & Integral) calibration, accuracy and efficiency are assured. Simple to use and with a clear easy to read LCD display, the HTRP-RF(50) is perfect for users who want complete control over their underfloor Integral) calibration, accuracy and efficiency are assured. Time and heat schedules are also fully programmable to optimise control and minimise energy usage. Control of the room temperature is simple, either locally from the thermostat or from the Smart Home App. 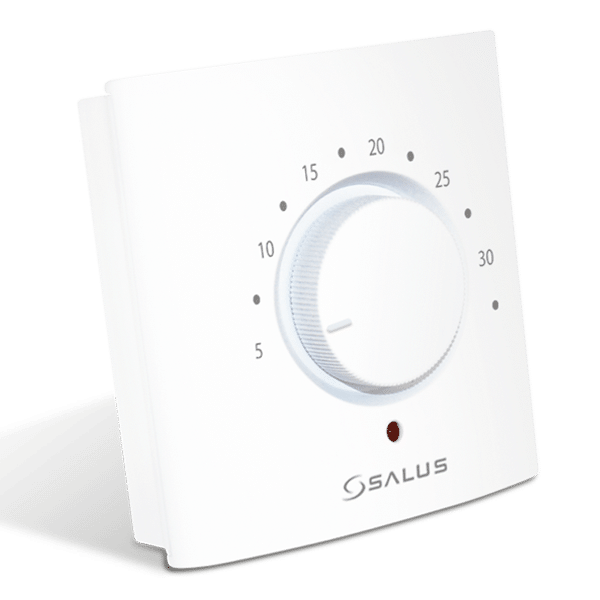 For hydronic heating systems the call for heat is then sent to the SALUS Smart Radiator Control which opens the radiator valve in response to the call. For Electric heating solutions, the call for heat is sent to the SR600 Smart relay, which switches on the electric heater. Or for underfloor systems the call for heat is sent to the KL08RF Wiring Centre, which opens the actuator for the area being controlled by that thermostat. In each heating system the heat will rise until it reaches the disired temperature for that room or area of the property and then turn off. As the temperature in that room or area drops slightly the heating will come back on to maintain the desired temperature requested. The SALUS TS600 Appstat is the latest addition to the SALUS Smart Home range. The TS600 has all the features of a traditional programmable thermostat but is uniquely controlled via the SALUS Smart Home app from a Smartphone, Tablet or PC. The TS600 is used to control heating via the Smart Home app. Unlike most thermostats that only work by controlling the central heating boiler, the TS600 is wirelessly connected direct to local radiators fitted with SALUS Smart radiator controls (TRVs) to maintain the exact temperature in the controlled area. The TS600 can be used in place of the HTRS-RF(30), in any of the 3 heating solutions. The TS600 is battery operated and connects wirelessly to the heating system, meaning that installation is quick, simple and mess free. 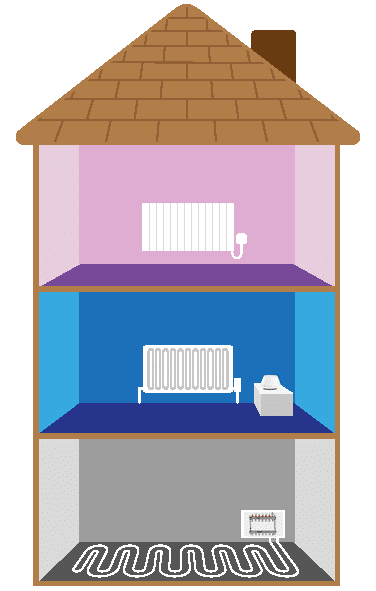 Up to 6 radiators can be controlled by a single TS600 and as the thermostat is remote from the radiator itself, it ensures that the required room temperature is maintained and not the temperature closest to the radiator maximising efficiency. This means that the user can control and adjust their heating, or even just a single room or radiator, from anywhere ensuring maximum comfort and efficiency. For detailed information on the 3 systems, please download the information guide.